DetroitKnitter: Is Your Computer is Running like an Old Dog? Is Your Computer is Running like an Old Dog? Another fix for your computer. Yes, my fixes come by experience. I'm not a computer tech. I'm a user and abuser. At anyone time I can and do have a multitude of windows running at the same time and a multitude of tabs on a multitude of browser windows. A friend once was laughing at someone he knew who was an excessive computer multi-tasker. I laughed and counted my open sessions of Word, Excel, and IE windows and tabs reporting back a whopping 27 internet tabs running, 6 windows of Word, 2 Excel spreadsheets and miscellaneous small programs like calculator and character map. He recently called me and caught me with two computers running on my desk while checking my email on my phone; I am now known by him as the "Master Multi-tasker". What can I say. Then I got a virus. Whoa! It was a Google redirect virus. It's behavior was that it would show me a list of sites that were relevant to my search but when I clicked on one of them I was sent off into a land of advertisements. Not good. As I tried to find a fix to this problem I developed a new one and had ads playing in the background. Well, mostly ads; I did hear a blip from one of Charlie Sheen's tours so at least that was amusing. Nevertheless, I finally found help from the guys volunteering in the forums at BleepingComputer.com and got rid of the nasty redirect virus and the annoying ads. So now my computer was clean of viruses, but OH MY, what happened to the speed? I did install an anti-virus program which admittedly I did not have before (oops, my bad). And the nice guy at BC helped me set some security options in my browser. But my trust-worthy 7 year old computer's internet browsing slowed to the speed of an old dog trying to find a ball in a pile of used socks. For the second time I pulled out the my Windows Recovery Discs and again prepared for the worst: a full system reinstall. In desperation to get speed, I uninstalled the anti-virus program and removed all the protection that I just started using in hopes of jump starting my system and getting my old buddy working within my high multi-tasking demands. ONE LAST THING TO TRY which I was really skeptical of doing anything. Yes, this was it, if it didn't work I was sticking in that recovery disk and and not looking back. I was feeling that I was destined to format and reinstall but what the heck. I grabbed my screwdriver, a can of air and plugged in the vacuum. I can tell you that I have never seen my computer look so bad inside. I couldn't even tell that the sound card was supposed to be green as it was a solid fuzzy gray. I extracted two very large dust bunnies with the suction hose of the vac before taking it outside for the what I can best describe as a small dust storm in my backyard. I skeptically plugged her back in and much to my surprise she was flying! Zipping back and forth from program to program and able to handle the most difficult internet browsing tasks even I could throw at it. That's it, all I did was clean it out; literally! I happily put away my Windows System Recovery discs, folded up the Best Buy computers-for-sale ad and turned back on all the safety features I had disabled and uninstalled. 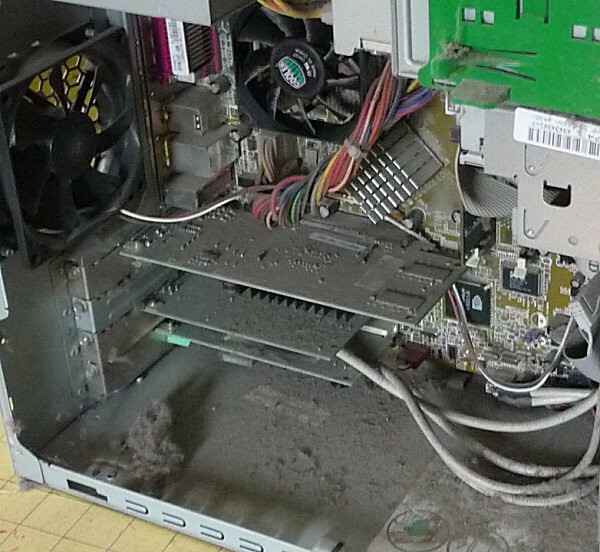 So as a lesson to all, if you're pulling your hair out due to a bogged down computer, pop off the panel and take a look; if it looks like mine, I definitely recommend cleaning it!